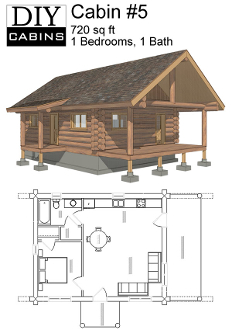 Log Cabin #5 is a 720 sq ft cabin with 1 bedroom and 1 bathroom. This cabin offers a seperate 6'x10' covered entry as well as a 6'x24' covered deck off of one end. Add a hide-a-bed or two and this cozy cabin can sleep several people. Flat ceilings over the bedroom and bathroom and vaulted ceilings over the living room and kitchen with a log ridge down the center gives this cabin a large interior appearance.